Posted in Misc and tagged Rossport, shell, Songs of solidarity at 11:15 am on January 8, 2016 by Broadsheet. 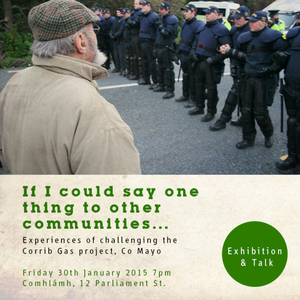 An exhibition of photography and oral testimony of the local response to the Corrib gas dispute at Comhlamh, 12 Parliament Street, Dublin at 7pm tomorrow night. Given how the communities all over the country are facing a Rossport-isation of policing with the water protests, this is one to highlight and attend. . Eye opening. Posted in Misc and tagged Rossport, Shell To Sea at 4:57 pm on January 29, 2015 by Admin. 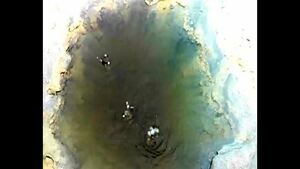 Video footage taken last Saturday of ‘bubbling puddles’ in Sruwaddacon estuary near Rossport in Co. Mayo. Posted in Misc and tagged Bubbling puddles, Rossport, shell at 12:34 am on July 9, 2013 by Broadsheet. 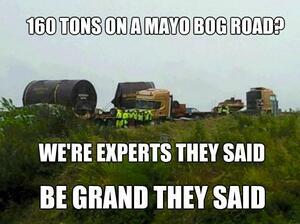 Ten years ago this summer An Bord Pleanála issued a preliminary judgement on the Corrib gas project. In a letter to the then developers, Enterprise Energy Ireland (later Shell E&P Ireland), the planning appeals board claimed that the proposed terminal at Ballinaboy in North Mayo might be prejudicial to the health and safety of local residents and urged the applicant to investigate alternative locations. 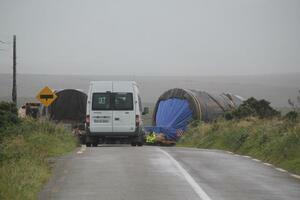 Among the possible sites mooted was the then vacant Asahi plant on the outskirts of Killala. A few weeks after receiving the letter from An Bord Pleanála, Shell E&P Ireland engaged in excavation work at Glengad Beach, the proposed site of the pipeline landfall. Later that summer, this newspaper published remarks from Fianna Fáil Junior Minister Frank Fahey who claimed that a failure to grant planning permission for the Ballinaboy terminal would be “a most detrimental blow to the economic development of the north-west and Co Mayo in particular”. A year earlier, Fahey, in his capacity as Minister for Marine and Natural Resources, had contacted Mayo Co Council to insist he be informed of the local authority’s decision on the Corrib project before it was made public. Many people perceived the minister as exercising undue influence on a planning process that was supposed to be independent. Posted in Misc and tagged Mayo, Rossport, Shell To Sea at 4:06 pm on August 10, 2012 by Ewok. This morning at about 4am hundreds of Gardaí and Shell private security (IRMS) mobilised to Glenamoy crossroads where sections of Shell’s tunnel boring machine has been stuck on a jack-knifed lorry for the last number of days. Since then convoys of lorries have been hauling stone from a stock pile inside the refinery to the site, dumping it into the field below the cab of the jack- knifed lorry. It is thought that they need better foundations than the bog road and fields in order to use a crane big enough to lift the weight of the lorry and the TBM. Since this morning the area is under police occupation on a scale similar to that during the Solitaire pipelaying operation in 2008 and 2009. With no warning or notices the North coast road between Glenamoy and Ballinaboy has been closed, there are Gardaí posted every 50 metres along this new haulage route and freedom of movement has been seriously curtailed. Anyone who wishes to come down to document the occupation and harassment of the community would be most welcome. Glenamoy locals have noticed the road subsiding under all the weight – this will become worse if they get a crane in there. The desperation of behalf of Shell and the Gardaí mirrors what is at stake – the Corrib project is literally at a crossroads and could be slipping into the bog that Shell have been fighting against for all these years. The camp is open and if you ever thought about coming up here then now is the time. The resistance over the last few days has been inspiring – starting with the protest presence Dublin port, the tracking across country and the protests and blockades in Mayo. Would the convoy drivers have decided to head down a bog road to turn for a better angle on the last corner if there had been no pressure? Besides protest actions to stop the delivery of the TBM to the tunneling site (if they manage to move it at all) there is all the other work needed to keep the show on the road (and the TBM stuck on it) – housekeeping, reporting, media work, tea, food, transport and lots more. If you can’t come please spread the word, and we’ll try keep you up to date as things happen. 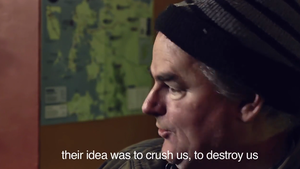 Posted in Misc and tagged Rossport at 3:02 pm on August 3, 2012 by Broadsheet. Posted in Misc and tagged Corrib, Rossport at 4:17 pm on July 31, 2012 by Ewok. 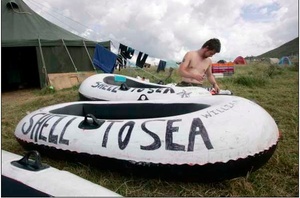 Posted in Misc and tagged Rossport, shell at 12:30 pm on July 31, 2012 by Broadsheet. 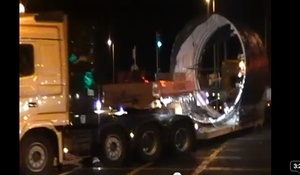 This is footage of Shell’s Tunnel Boring Machine (TBM) leaving Dublin Port as it began its 320km journey to Rossport in North West Mayo on Sunday night. The private energy company intends to use the TBM to bore a tunnel for a highly controversial gas pipeline which will link the Corrib Gas Field to the company’s gas refinery at Ballinaboy. 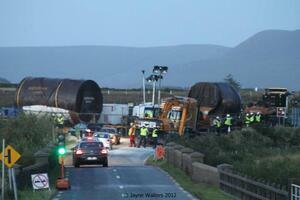 The video shows part of the massive Garda operation that has been put in place to assist Shell transport the TBM to Mayo. Such use of Garda resources has become commonplace over the last seven years as the state has spend tens of millions of euros facilitating Shell’s exploitation of the Corrib Gas Field. The Corrib Gas Field is believed to contain tens of billions of euros worth of natural gas. The deal which saw Shell gain ownership of Corrib was based upon a legal framework developed by politicians including Ray Burke and Bertie Ahern. Gas, but will instead have to buy back their own gas from Shell at the full market rate. We are calling for the immediate nationalisation of the Corrib Gas Field, the Barryroe Oil Field and all other Irish hydrocarbon resources. Posted in Misc and tagged éírígí, Rossport, shell at 12:42 am on July 31, 2012 by Broadsheet.